Scott Hunter was visiting Louisville for the Kentucky Derby when he was shot and killed on May 2. His death has created a painful void for his friends in Cabbagetown and Leslieville. 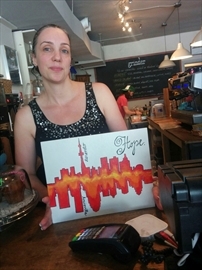 In late July, students from Louisville’s Westport Road Baptist Church visited Grinder Coffee and gave Scott’s friend and business partner, Joelle Murphy, a painting in his memory. Members of Scott’s family and his friends were there as well. “It was just incredibly kind of them to do this” Joelle said. Inside Toronto has the full story. The City of Toronto has been holding formal reviews of its rooming house licence for a Berkeley Street building owned by Peter Diakogeorgiou that’s at the centre of a serious controversy. On the one hand, area residents have regularly complained about fights, trespassing, drinking and excessive noise. The police have visited it 27 times in the past year. MLS inspectors have been there three times and found building and health violations. In 2012, fourteen special conditions were attached to the rooming house licence and during the 2015 renewal, officials determined that ten of them were neglected. On the other hand, city officials fear that revoking the licence will simply put the building outside their jurisdiction and the offenses will get worse. A resident fears that closing the place will force him into another apartment at rents that he cannot afford – he now pays $700 per month. A decision is expected in September. As mentioned last week, the Cabbagetown BIA is developing a project to inform us about effective ways to work with the police to create a safer community. There are several ways to contact the Police Service. Click here and scroll down to read the tips. 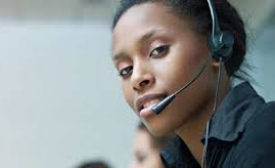 When any incident occurs, you are urged to report it. When police see a pattern, big or small, they allocate resources to investigate and prevent problems. If you have ongoing problems, you should use the services of the Community Relations Officers who can assist you with these issues. Reduce the risks around your property by using good design – the police have an online pamphlet on Crime Prevention through Environmental Design. Register your bike – it’s free, quick and easy. Click here. Green Thumbs helps to build gardens for schools and their surrounding communities. On Saturday, August 8, you can tour three school gardens. The tours at Winchester Public School (Winchester & Rose) and Rose Ave Public School (675 Ontario) happen from 10:30 am to noon and at Sprucecourt Public School (70 Spruce) from 10:30 am to 1 pm. There’ll be mid-morning snacks, children’s activities, giveaways and prizes and live music. 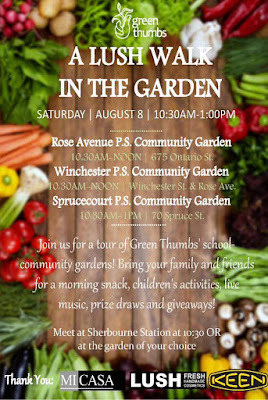 To start, go directly to one of the schools or meet a group at the Sherbourne Station. The 24th edition of the annual festival celebrating Regent Park life. 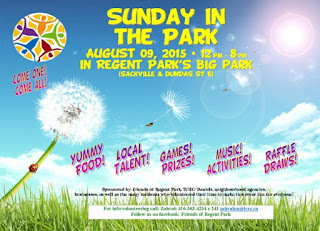 Sunday August 9, Regent Park’s Big Park (Sackville & Dundas), free. There’s be dance competitions, children’s activities, raffles, games and prizes, music by local talent, food stands and lots more. The cemetery was opened in 1844 as the final resting place for Toronto’s elites. The names on many of its graves honour people who had a major impact on Canada’s history and culture. Its chapel has become a National Heritage Site. 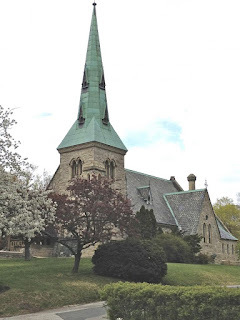 The tour – sponsored by the Cabbagetown Preservation Association and Herirtage Toronto – will visit these and many other highlights. Sunday, August 16, 1:30 pm, free. These two guys will bring a unique perspective to the federal election. Although they’re both running in ridings outside Cabbagetown, both live here. 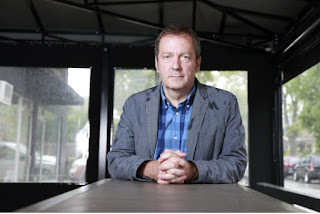 Noah Richler, the author and literary organizer, has tossed his hat into the ring in downtown Toronto-St Paul’s riding. He’ll be the NDP candidate and will have lots to say about Canadian cities, child care and precarious work. 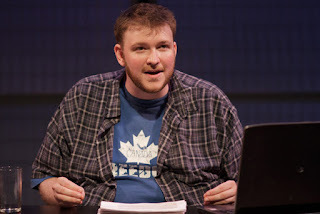 In early July, Alex Boutilier profiled his candidacy in a Toronto Star article. Tommy Taylor is the Green candidate running against Liberal (and former police chief) Bill Blair in Scarborough Southwest. Taylor was arrested and thrown into the detention centre in June 2010 during the G20 protests. Blair has subsequently refused to answer his questions about that detention. Taylor has written an acclaimed play about his experience – You Should Have Stayed Home. Now he hopes to face Blair in debates and make him ‘fess up. Jonathan Goldsbie has the details in his August 5 NOW Magazine story. Our pal, Danny Marks, is taking an academic turn. From September 24 to October 29, he’ll be teaching a course at the Royal Conservatory on the Passion of the Guitar. Who better than Danny to do this? Anyone who’s watched his shows can attest to his love and skill with his instrument. The course goes from 7 to 8:30 pm for six weeks. $225. The Royal Conservatory website has details and registration info. Arthur came to St James Town in 2005 with his family when they fled the civil war in Chechnya. With his older brother’s encouragement, he started boxing and trained at North York’s Atlas Gym with Adrian Teodorescu. In late July, he won the gold medal in light-welterweight boxing against Cuba’s Yasnier Toledo – the first Canadian male to score a Pan Am boxing gold medal since 1975. Toledo, his opponent, is one of the world’s top-ranked boxers and Arthur’s victory is sweet prediction of more success for him in the 2016 Olympics. 1600 athletes from 28 countries will compete in 15 sports during the ParaPan Am program – a record number, up from 1300 in 2011. In each sport, the athletes will be competing for qualifying spots to the 2016 Paralympics in Rio. 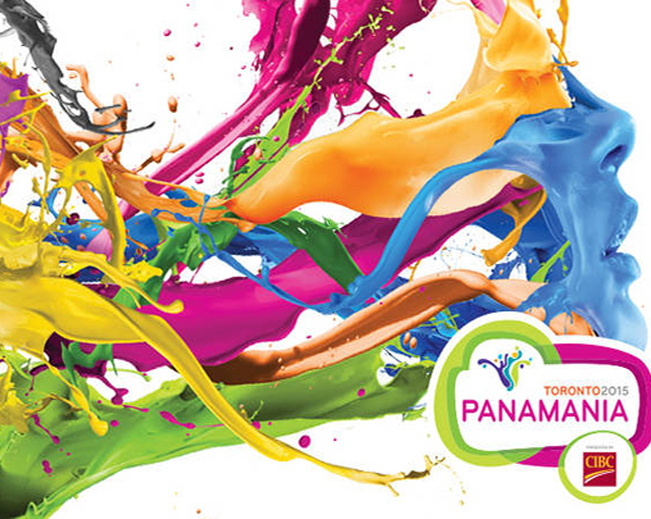 The opening ceremonies happen on Friday August 7 and the Games close on Saturday August 15. For a description of each sport and its rules, click here. Schedule info – both the overall general listings and the daily listings – can be found here. The Young Centre (50 Tank House Ln, Distillery) is one of the performance centres for Panamania. Ticket info and program details online here. Onstage to August 8. 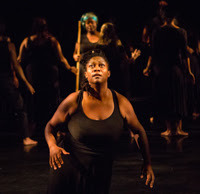 An all-female cast tells the story of the Salem witch trials from the perspective of enslaved African women. An a capella theatrical epic. Sorry – tickets for the final performances are all sold. 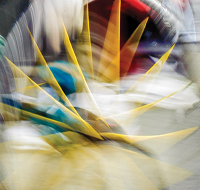 This winning production traces the history of Paralympic competition from 1944, weaving the stories of each athlete to show the diversity of world-class athletes with disabilities. Monday August 10 to Friday August 14 – the shows on August 10 and 11 are sold out. Matinee at 2:30 pm on Wednesday and evening shows at 7:30 pm. 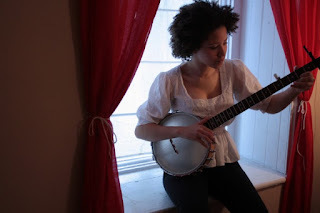 Kaia Kater will perform Appalachian and Canadian traditional music on the Distillery`s Trinity Stage on Wednesday August 12 from 6 to 8 pm. Free concert. Wednesday from 7:30 pm. 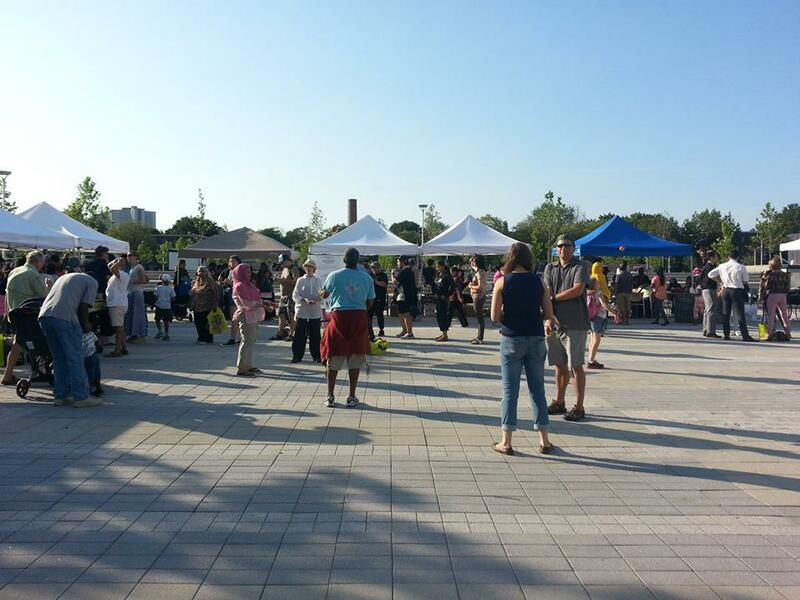 Free screenings in Regent Park (620 Dundas E), following “Taste of Regent Park”. 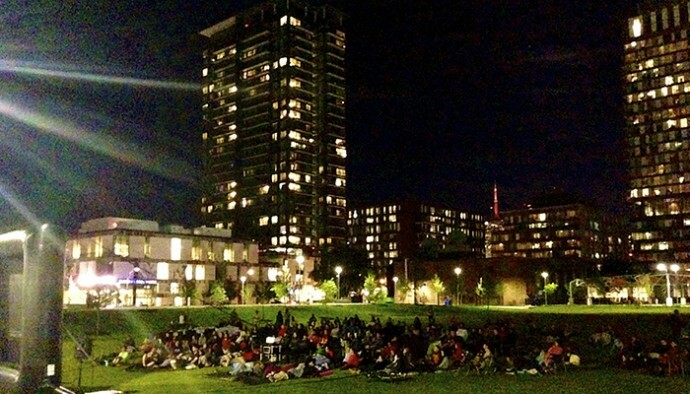 On Wednesday August 12, it’s Bollywood movie night. Popcorn and refreshments will be available during the movies. If it rains, everything moves inside the Daniels Spectrum (585 Dundas E) in the Artscape Lounge. 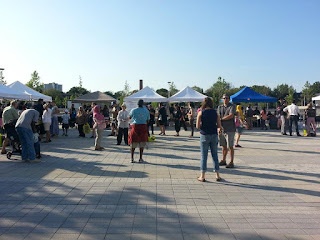 Taste of Regent Park – Wednesdays from 5:30 to 8:30 pm, Regent Park (620 Dundas E). 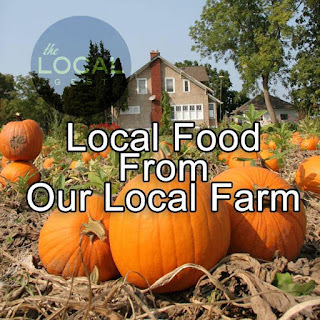 The event includes farmers booths, local food tastings and associated music. Outdoor movies follow the market. There are lots of notes about events and food on Facebook. 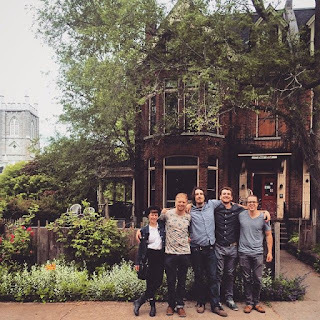 Common Deer appear at the summer concert series on Thursday August 6 at 7 pm in Little Trinity Park (King and Trinity). 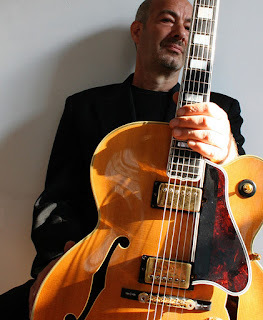 On Thursday August 20, the series finishes with the Conor Hall Trio. The concerts are free. Bring a lawn chair or a blanket and enjoy a charming musical experience. The holidays are over and the café is opening again on Friday August 7 at 8 am. You can now order in advance and pick up your goodies on your designated date between 8 am and noon. Some minimums may apply. Short notices may be possible but a 48-hour advance notice is better. Please prepay your order. 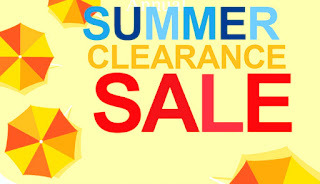 Call (416) 833-4248 or email cafeolya@gmail.com. Drop in personally – Café Olya, 540 Parliament. Regina is on the move. She’s closing her current store (242 Carlton) and scooting right across the street to the former Me To We Store (223 Carlton). She’ll give us all the details soon. It’s a good situation for all of us. Regina will be able to continue with the goodwill that she’s built up over her five years in Cabbagetown. Plus the retail strip along Carlton will enjoy another healthy store on its south side. Kendall & Co (514 Parliament) is bringing in some exciting new arrivals soon and the store has to be emptied out to make room. Save up to 60% off everything now! Ask the staff about final markdowns on rugs, mirrors, upholstered furniture, tables, cabinets and lighting. 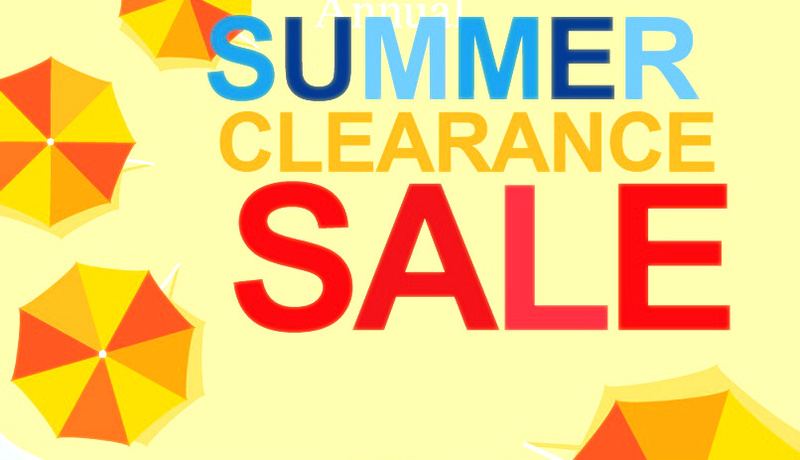 Shop now – the best deals are in the store. 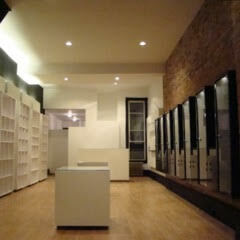 Store hours – Monday to Friday, 10 am to 6 pm, Saturday. 11 am to 5 pm. Monday August 17. It’s the first tournament at the HOP’s new destination, Westview Golf Club in Aurora. 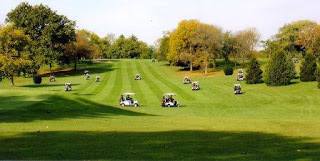 A jam-packed day with lunch at the club, guaranteed good fun with your golfing pals, a cart, lots of prizes and dinner at the HOP. You’ll get a bus ride from the House on Parliament (454 Parliament) and back again. 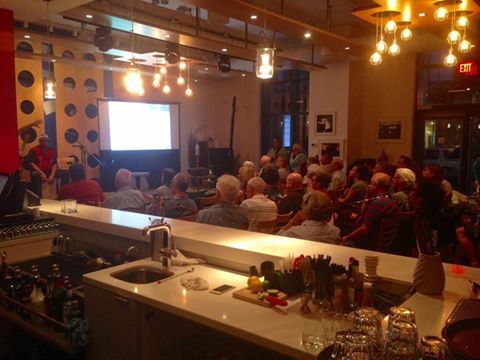 Reserve your spot at (416) 925-4074 or, better yet, drop in to the pub. $130 pp. The restaurant closed early on Wednesday – a brand new granddaughter arrived and everybody rushed to the hospital to have a look and enjoy her company. 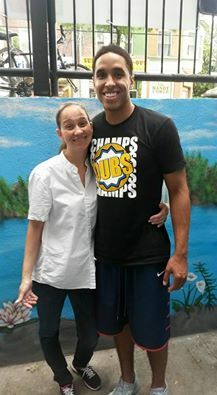 This happened just a few days after Malcolm Brogdon from the USA Pan Am basketball team dropped in for dinner. Altogether, a good time for Kim and Betty. 568 Parliament. Souffles, both savoury and sweet, are scheduled for Tuesday August 11 from 6 pm. Cyril wants to show you how easily you can whip up these cloud-like concoctions. If there’s enough interest, an additional soufflé session will be held on Tuesday August 18 at 6 pm. Sous-vide is the second topic. It’s back again, thanks to popular demand. Monday August 10 at 6 pm. To reserve your spot, drop in to Merryberry (559 Parliament). You can also call him at (647) 348-0411. $45. Every Thursday, Geoff Willingham plays from 7 to 11 pm. The patio`s open and you can save $10 on a bottle of wine or enjoy a 32 oz personal pitcher of Beau`s for $9. 195 Carlton. It`s been two years since Tiffany, Gary, Erique and Sean opened their pub (424 Parliament). 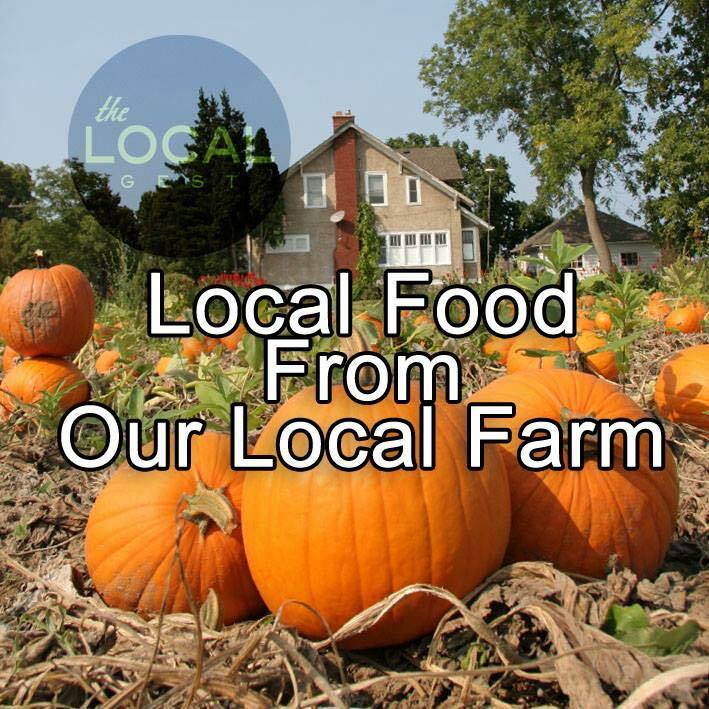 They`ve established themselves in the community with early morning Gold Medal hockey broadcasts, fundraising evenings, Noah, Zach and Porter, lots of jazz, great farm fresh food, and always a warm welcome. Here`s a toast to many, many more anniversaries! The Corktown Ukulele Jam happens every Wednesday at 7:30 pm at the Paintbox (555 Dundas E). Everyone welcome. And don`t miss the Alphabot Send Off Show on Saturday August 8 from 7 pm, $6 at the door. AccessTO is a new website that’s listing locations across Toronto that have accessible facilities. Its description of Young Thailand (446 Parliament) also includes an enthusiastic endorsement of its food and staff. 7:30 pm, outdoor movies with Bollywood movie night and Bollywood pre-show.